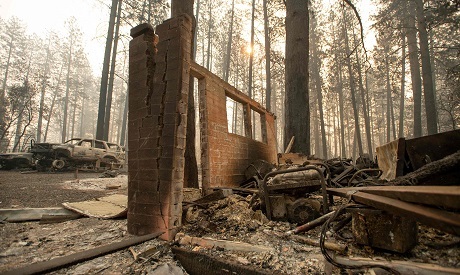 The death toll from destructive fires hitting California rose to 23 Saturday as rescue workers recovered more bodies of people killed by the late-season infernos. Firefighters battled raging fires at both ends of the state -- in Butte County, a scenic area in the foothills of the Sierra Nevada mountains north of Sacramento, and in the Los Angeles area, where two deaths possibly related to a fire were reported. There is little hope of containing the flames anytime soon, as the National Weather Service said strong winds and dry conditions were expected through the weekend. "Today, 14 additional bodies were located, which brings our total number to 23," Butte County Sheriff Kory Honea said at a late Saturday news conference as he discussed a blaze known as the "Camp Fire." Acrid smoke from the fire covered the sky for miles, the sun barely visible. On the ground, cars caught in the flames were reduced to metal carcasses, while power lines were gnawed by the flames. Mandatory evacuation orders were issued for more than 52,000 people in the area. In the town of Paradise more than 6,700 buildings -- including a hospital, a gas station, and several restaurants -- have been consumed by the fire. Rescuers removed human remains over several hours in Paradise and placed them in a black hearse. Charred body parts were transported by bucket, while intact remains were carried in body bags. At the Holly Hills Mobile Estate the mobile homes had been reduced to smoldering piles of debris. Yellow police tape marked spots that were tagged "Doe C" and "Doe D," suggesting that bodies were found there. Fanned by strong winds, the blaze has so far scorched 100,000 acres (40,500 hectares) and is 20 percent contained, the California Department of Forestry and Fire Protection (Cal Fire) said. So far, three of the more than 3,200 firefighters deployed have been injured. Local power authorities told state officials that an outage occurred near the spot where the fire erupted, The Sacramento Bee reported, but there is no official cause of the Camp Fire blaze. President Donald Trump, traveling in France for World War I commemorations, drew criticism for his unsympathetic reaction to the devastation. Brian Rice, the head of the California Professional Firefighters, slammed Trump's tweet as "ill-informed, ill-timed and demeaning to those who are suffering as well as the men and women on the front lines." Trump later showed more sympathy. "Our hearts are with those fighting the fires," as well as the evacuees and families of the victims, he tweeted. "God Bless them all." Two bodies were found in Malibu -- one of the most coveted locations in California for Hollywood stars seeking privacy and luxury -- in an area where the "Woolsey Fire" swept through, the Los Angeles County Sheriff Department. However the incident "is being investigated by the homicide department," an LACS spokesperson told AFP. The Woolsey Fire has consumed around 83,000 acres, destroyed at least 177 structures and was five percent contained, Cal Fire said late Saturday. Evacuation orders had been issued for some 88,000 homes in Ventura County and neighboring Los Angeles County. The wildfire reached Paramount Ranch, destroying the Western Town sets used for hundreds of productions including HBO'S sci-fi western "Westworld," network officials said.